Here's good news for those who wish to enter the police force of the Philippines. 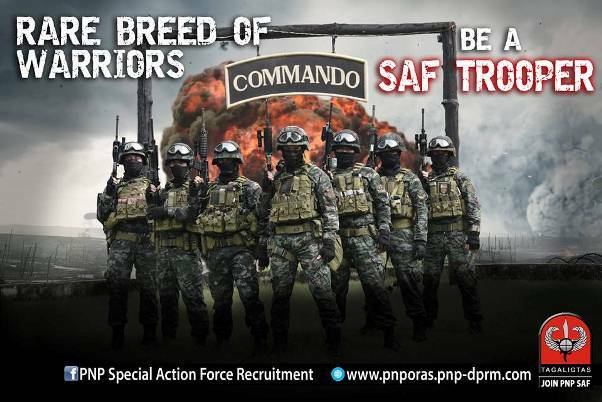 You can now apply online if you want to become a new member of the Special Action Force (SAF) of the Philippine National Police (PNP). The national police force has a website called the PNP Online Recruitment Application System (PNP ORAS) which allows you to register and fill up the application form. Before anything else, you should make sure that you are qualified to apply before you visit the website and fill up the registration and application form. Now, if you meet the requirements and you have the documents mentioned above, then you are ready for your PNP SAF online application. But before you proceed, you should make an email account first. You are going to need an email address to register and activate your account. If you don't have an email address, you should create one with Gmail right now. It's free and it only take a few minutes to create one. Go now and create an email account with Gmail. Are you done with Gmail? Yes? Then you are ready. 2. Click on the button that says "Join Now". 3. Fill up the registration form. Don't forget to input your email address because that's where the PNP will send your username and password for your account. 4. Open your email account, go to your inbox, and look for the email sent by the PNP. 5. Copy the username and password sent to you then click on the activation link. 6. Log into your PNP ORAS account using the username and password sent to you. 7. Click on the "Home" tab to view your application status. 8. Click on the "Application Form" tab to fill up your application. 9. Fill up all the necessary information. 10. That's it. If you've followed all of the steps above, all you need to do now is wait for a message or confirmation regarding your application. Note: Keep in mind that you can always view the status of your application by logging into your account and clicking on the "Home" tab.